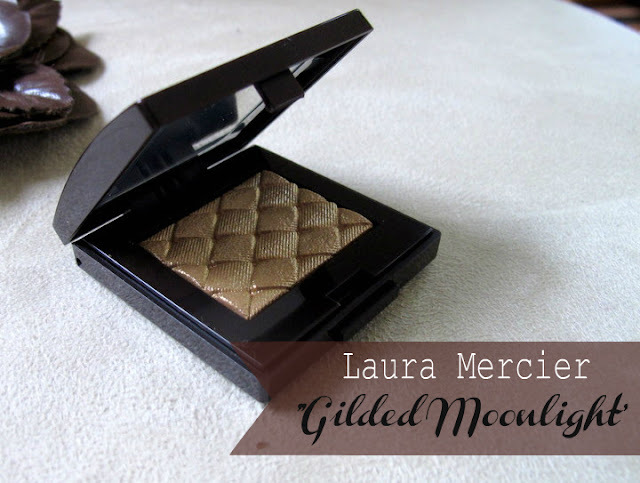 This gorgeous eyeshadow (AUD $35) is from Laura Mercier's Art Deco Muse collection, available now, which was inspired by 1920s Paris and the decorative Art Deco movement. It's the perfect gold shade to decorate your eyelids with. Insanely pigmented, one swipe is enough for a good amount of colour deposited on your lids. This colour would look great paired with a slick black liquid liner and a glossy red lip. It would be great for a festive look, but it's also versatile enough to be worn everyday, even in cold weather! I decided to incorporate the gold with a smudged smokey eye look. I wore Gilded Moonlight all over my eyelid, inner corner and bottom lashline. In the crease I wore a matte light brown shade (MAC Sable... very similar to Buck from the UD Naked Palette). I lined my eyes with a black pencil eyeliner then smudged it with a black eyeshadow for a messy smokey eye look. And topped it off with 2 coats of black mascara. Overall I'm loving the look, and absolutely loving this eyeshadow. I think this is a look I'll do more often as it's so easy, I don't have to worry about precisely applied liner or perfectly blended eyeshadows... this is the lazy girl's answer to a golden smokey eye. Do you have a favourite gold eyeshadow? How do you wear it? Oh wow - thanks for this! Will have to check out LM eyeshadows soon. This particular one looks smashing!! Oh, that's so pretty! Love it! It does look like a perfect 1920s gilded golden shadow. Perfect for a Great Gatsby inspired look! Oh you look so gorgeous Lilit! My current favourite gold is Hourglass Beige from L'Oreal. It's more of a white gold so it's quite versatile. Such a pretty eyeshadow, never seen it before. And I'm all about smudged liner these days instead of a neat line. More room for error! My favourite gold is probably woodwinked.